» 9 Toxic Ingredients Found In Your Mouthwash … Are You Accidentally Ruining Your Teeth? 1. Alcohol – That tingling sensation you feel as you swish mouthwash around is often caused by this common ingredient. Alcohol is added to mouthwash to kill the bacteria in your mouth. The problem is that alcohol is too potent as an antibacterial and will destroy both the good and bad bacteria. Moreover, alcohol dries out the mucous membranes in your mouth, resulting in decreased saliva output and worse breath than before. 2. Artificial dyes – Similar to cetylpyridinium chloride, artificial dyes can stain your teeth with repeated exposure. What’s more is that the most common artificial dyes – FD&C Blue No. 1 and FD&C Green No. 3, among others – are toxic to living cells and can put an unnecessary strain on your liver. 3. Benzalkonium chloride – A mouthwash disinfectant ingredient that has since become known as an allergen. Benzalkonium chloride can irritate the skin and mucous membranes, causing side effects like difficulty breathing, chest tightness, and the swelling of the lips, mouth, and tongue. 4. Cetylpyridinium chloride – Because it contains high amounts of alcohol, taking in cetylpyridinium chloride can culminate in tongue sensitivity and irritation. The harmful effects of cetylpyridinium chloride don’t stop there. It can cause stains to develop on your teeth and leave them discolored. 5. Chlorhexidine – Like alcohol, chlorhexidine kills good bacteria. Instead of just focusing on bacteria in your mouth, however, this chemical may also lead to increased blood pressure and a greater risk of detrimental heart conditions. 6. Hexetidine – Also known as oraldene, this antibacterial and anti-fungal chemical is dangerous when taken in excess. Among the potential health effects of hexetidine are unstable heartbeats and allergic reactions. 7. Methyl salicylate – This chemical is typically used as an antiseptic, and to add fragrance and flavor to mouthwashes. In its purest form, methyl salicylate is toxic, especially when ingested. Overdosing on methyl salicylate can prompt vomiting, convulsions, vision loss and even kidney failure. Just a tiny dose can be fatal to young children, so this is one ingredient you should avoid as much as possible. 8. Methylparaben – To extend the shelf lives of their mouthwashes, manufacturers will often include this anti-fungal chemical preservative as an ingredient. Because it’s a paraben, methylparaben is an endocrine disruptor. This means that it impedes hormonal processes and can boost the risk of developing illnesses linked to hormones, such as estrogen deficiency. 9. Triclosan – This widely used antibacterial agent can be found in a multitude of household cleaning products, mouthwash included. According to the U.S. Food and Drug Administration (FDA), high doses of this chemical may actually lower your thyroid hormone levels. Reducing your vulnerability to these dangerous ingredients is as simple as opting for more natural ways to keep your mouth healthy and clean. Health Ranger Select Colloidal Silver Mouthwash is one such option. There’s absolutely no alcohol, artificial dyes, or chlorhexidine in this all-natural oral care product. Every bottle is loaded with nothing less than 100 percent non-GMO, bacteria-fighting ingredients such as colloidal silver, peppermint oil, and tea tree oil. 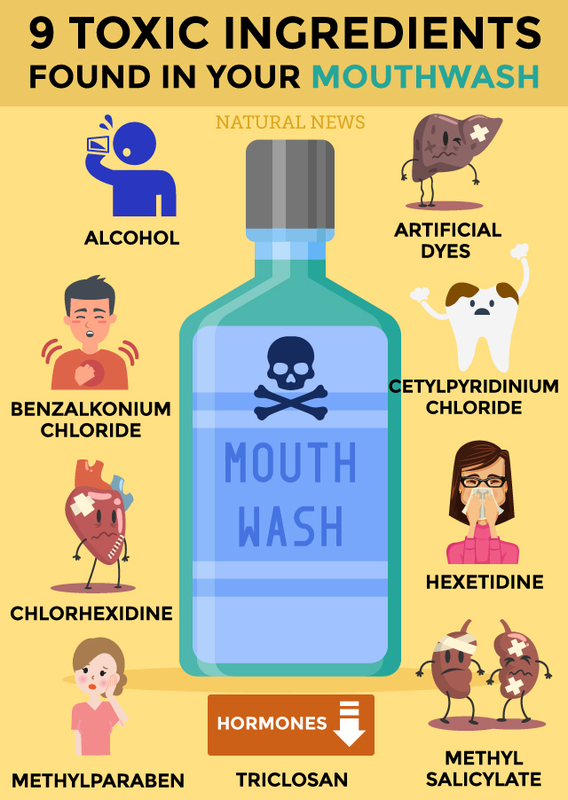 These ingredients work together to clean your mouth better than commercial mouthwashes, without any of the risks associated with their common ingredients. Source: 9 Toxic ingredients found in your mouthwash … Are you accidentally ruining your teeth?